Together Again . . .
Jan and I headed out about 11:30 to have one last meal at La Bella Tavola for their delicious Chicken Florentini. 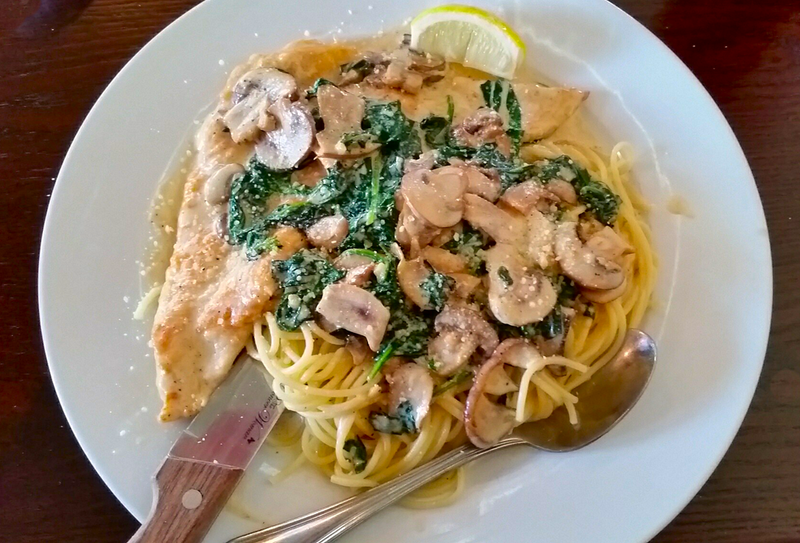 With fresh spinach, fresh mushrooms, and fresh garlic in a smoky alfredo sauce, it’s probably the best pasta dish we’ve ever eaten. And you can’t leave out their very tasty homemade yeast rolls. We’re looking forward to coming back here again in September. Then it was on to Wal-Mart to check out their somewhat meager cellphone selection. The Cuero Wal-Mart is one of the old ones, with the small grocery area in the center, so their phone area is small too. So we’ll have to look further. Then it was on to the HEB gas station to fill up. We were still at 3/4 of a tank, but since we’ll be driving into Brandi and Lowell’s tomorrow evening, we won’t have to get gas on the way back. Getting home about 2:30, I started working through my short list of things I wanted to get done before we leave tomorrow morning. The main one was to replace rig’s expired tags with the new ones I got back in November. I put the new ones on the truck when they came in, but put off replacing the ones on the rig. In fact I put it off so long that we drove over here last month from Kenedy to on the expired ones. But we’re legal now. Part of me wants to take a nap since I only got about 5 hours sleep this morning. But I’m resisting the urge so I can go to bed at a decent time and get a full night’s sleep. The park owner will be coming over tomorrow morning about 9 to settle up for our electric usage. Even though we paid for a month, we’ve only been here 25 days, but I doubt I’ll be getting a refund on that. Although we did get a refund when we left Lone Star RV Park in Kenedy 11 days early, so there’s always hope, I guess. Speaking of money, my last shift yesterday was actually in the next pay period, but SiteWatch was nice enough to go ahead and include it in the check we will get next Monday. Very nice of them. While we were at Wal-Mart this morning, Jan made a fantastic discovery in the candy aisle. M&M now makes COFFEE-flavored M&M’s. Of course reading the label, they contain no actual coffee, but they taste good, and it’s the thought that counts, right. Grammar Pedantry Syndrome is a disorder where a person has an uncontrollable urge to correct grammar mistakes. Or it could just be a mother who was an English teacher.